Affordable bathroom renovations are possible if you change or upgrade one thing at a time in your bathroom. Staying within the budget can be quite hard when renovating our homes. Our advice to clients is to start small. If you are thinking of renovating your bathroom, then start by renovating parts of the bathroom rather than the room at once. Traditional towel rails complete with a radiator fitting underneath is a fantastic addition to shabby chic, country-themed or classically styled bathrooms. The radiator exudes warmth into the room and draping your towel over the rail while you shower or bath guarantees you a beautifully cosy and warm towel; like an unexpected cuddle on a cold day! Modern bathrooms often feature smooth modern chromed fittings and it is possible to acquire a matching towel rail too. The chromed towel rails come in a variety of styles, from straight and simple to curved and ornate, ideal for allowing you that extra element of choice in your décor. The Greenhithe project by Superior renovations is a classic example of how a towel rail can be added to complement a modern bathroom. Sturdy stainless steel is a fantastic choice, especially as it looks as good as less durable products giving your bathroom an air of elegance and grace along with the functionality of the steel. Again, there is a wide range of styles, from blocky squared radiators to slender elegant bars: something for everyone! For those who do not like the popular colours for their bathroom fittings, there are also options such as anthracite (which is a beautiful very dark grey, usually featuring a metallic sparkle). These more unusual colours will probably not have the full range of shapes and sizes that the more common colours do, but it is almost certain that you will find something that you do like. Another more unusual option is the pure white bathroom fitting, which can be used to great effect to offset brighter walls and fixtures, or to complete a dazzling white bathroom! White is a great choice for the practical decorator, as it is easily matched whenever repairs and patches are needed, and can negate the need to repaint or redecorate the entire room when only one wall or feature is in need of attention. 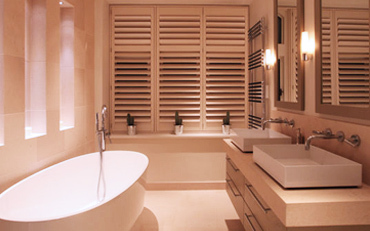 For more compact bathrooms, the idea of a heated towel rail may see to be an impossible dream. Manufacturers are very aware of the sometimes very cramped bathroom sizes and unusual shapes, and have designed wonderful ranges of bathroom furniture and fittings to fit even the tiniest space! Start your affordable bathroom renovations to make your dream a reality.